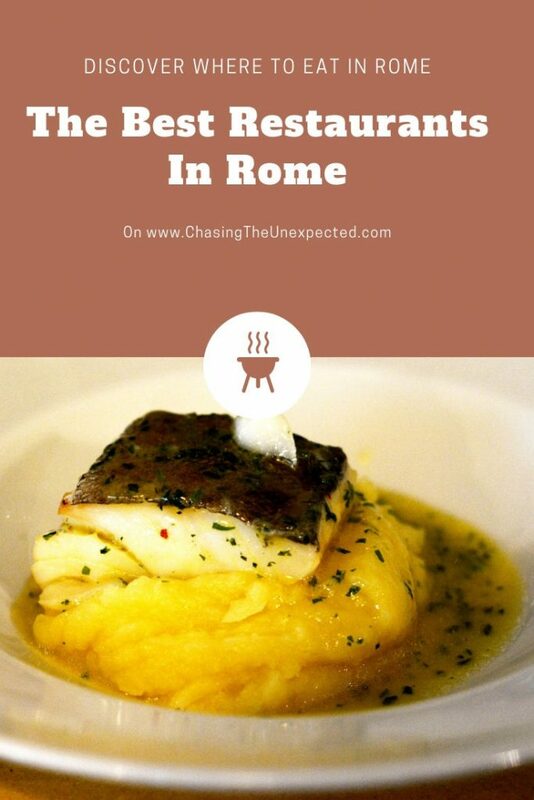 Finding the best places to eat in Rome is not always easy, especially in the city centre. While the options on the menu might sound familiar and their location is often unbeatable, around the main landmarks is likely to find tourist traps. Our extensive Rome food guide stems from years of exploring the local food scene, trying historic restaurants as well as new openings. If you are unsure where to eat in Rome, here you will find a comprehensive selection of places to enjoy a perfect lunch in Rome, a romantic dinner, a traditional dish, some seafood treats and more. With so many options, it’s not very easy to spot the best restaurants in Rome. But we’ve done our best to include the top places for different types of food, meals and budgets. This is a choice of the best restaurants in Rome city centre. Some serve traditional Roman dishes, some more modern creations, all great food. I listed here some mixed options to meet all (or most) preferences. Armando is one of the best authentic restaurants in Rome city centre. If you want to try traditional Roman food, this is a great place. Famous for their cacio e pepe (pasta with Pecorino Romano cheese and a generous sprinkle of black pepper), at Armando you can taste many dishes of the local tradition. Meat lovers should try Armando’s coda alla vaccinara, oxtail properly braised in tomato according to tradition, abbacchio a scottadito, grilled lamb chops, or the typical saltimbocca alla Romana, veal with cured meat and sage. Pasta fans, apart from the cacio e pepe, will find also spaghetti all’amatriciana, carbonara and aglio, olio e peperoncino (with garlic, olive oil and chilli pepper). Address: Salita de’ Crescenzi 31; Phone: +39 06 6880 3034; Website: www.armandoalpantheon.it. Prices: 10-20 euro the first courses, 15-25 euro the main dishes. One of the big names of the Roman food scene and often referred to the best trattoria in Rome Esquilino neighbourhood. Of simple and old-style decor, Trattoria Monti serves the dishes of the Marche region and central Italy, starting from the antipasti (starters), primi (first course), secondi (main dishes) and contorni (side dishes). This family-run trattoria is a perfect place to try the classics of the central Italian cuisine including meat dishes, fish-based courses as well as recipes for vegetarians. Address: Via di San Vito 13/a; Phone: +39 06 446 6573; Prices: 12 euro first courses, 15-18 euro main dishes. A relatively new opening in Monti neighbourhood, Cuoco e Camicia was quickly welcome by the locals and hasn’t been showing any sign of cooling. They pride themselves with using only seasonal veggies grown open-air and animal products from small local farms. Everything they use is homemade, including pasta and bread, and their flours are only Italian untreated, organic stone-ground. Among their dishes are potato gnocchi stuffed with salted codfish, seafood and tomatoes, spaghetti with shrimps on a sauce of ink squid and rosemary, beef fillet with baked carrots, raspberries and sour cream. You can also find rich tasting menu with either meat or fish dishes priced 75-80 euro. Open only for dinner, Sunday also lunch, closed on Monday. Address: Via Monte Polacco 2/4; Phone: +39 06 8892 2987; Website: www.cuocoecamicia.it/en/homepage-inglese/; Prices: 13-14 euro the first courses, 20-22 euro the main dishes. A stone’s throw from Piazza Navona, Retrobottega makes recipes with a daring combinations of flavours and ingredients. The kitchen is visible from the restaurant, so you will have a real-time show of the chef preparing your dishes. The menu changes constantly, but some of the dishes to try if you find them are tortelli with Roman broccoli and anchovies, rice with malt and smoked Speck cured meat, stockfish with onions. Address: Via della Stelletta 4; Phone: +39 06 6813 6310; Website: www.retro-bottega.com/en/; Prices: 15-18 euro the first courses, 20-28 euro the main dishes. This is an enoteca, wine cellar, where you can order traditional Roman dishes as well as from the other Italian regions and countries like Egypt, Armenia and France. First courses, starters, appetizers, cheese and cold cuts trays are carefully paired with one of their 1500 wines on the list. Among their special dishes are the Armenian topik, the Lebanese eggplant cream baba ganoush, the onion soup, red lentils cream and artisan lasagne. Address: Piazza di Pasquino 73; Phone: +39 06 6880 1094; Website: www.enotecaculdesacroma.it; Prices: 8-10 euro first courses, 7-11 euro second courses. Close to Pantheon and Piazza Navona, Ginger Sapori e Salute is one of the unusual restaurants in Rome. Here the Roman tradition meets a daring combination with ingredients that are a relatively new entry in the Italian cuisine, such as spirulina and chia seeds. Their recipes are entirely made with locally-sourced organic ingredients, and their menu is pretty diverse to make everyone happy, vegetarians included. They are open the whole day so you can stop here for breakfast, lunch, dinner or just a casual snack. Address: Piazza Sant’Eustachio 54-55; Phone: +39 06 686 4995; Website: www.gingersaporiesalute.com/; Prices: 10-14 euro first courses, 16-24 euro main dishes. Nonna Betta is a sort of institution and any Rome food guide wouldn’t be complete without it. Arguably the best traditional Roman Kosher restaurant in Rome’s Jewish Quarter, here you can order very tasty and quite heavy meals. If you are looking for some typical food to try in Rome, eat at least once here. Some of the dishes to try are ravioli dumplings with sea bass and cheery tomatoes, smoked cheese and salmon risotto, artichoke lasagna, codfish Nonna Betta style, tuna scallops in white wine, and the main dishes of the tradition such as amatriciana, carbonara, beef oxtail coda alla vaccinara. For who wants to try the recipes of the tradition, this is by all means one of the best local restaurants in Rome. Address: Via Portico d’Ottavia 16; Phone: +39 06 6880 6263; Website: www.nonnabetta.it; Prices: 10-13 euro first courses, 11-20 euro main dishes. This is one of the places to eat in Rome if you want traditional Roman food in the very city centre. This is the restaurant of the politicians due to its proximity to the Parliament and also the high-quality of their dishes. If you are looking for a great Roman meal and wondering what to eat in Rome, here you can order all the dishes of the local tradition, from a creamy tonnarelli cacio e pepe, spicy penne all’arrabbiata pasta, spaghetti with clams, stewed rabbit with wine, stewed veal shank, lamb or saltimbocca alla romana. For the quality of the dishes, prices are not too high, making this one of the best affordable restaurants in Rome city centre. Open for lunch and dinner, Sunday closed. Address: Vicolo Rosini 4; Phone: +39 06 687 3434; Website: www.ristoranteparlamento.roma.it/; Prices: 8-12 euro first courses, 8-16 main dishes. This is a very famous restaurant in Rome serving dishes from Emilia Romagna northern region. Here you can try one of the best pasta in Rome, “pasta all’uovo” (egg pasta), more precisely, typical from Bologna’s region. Your Roman meal at Colline Emiliane will be scrumptious, very tasty and pretty heavy. But you will hardly forget it. Some of their specialties include tortellini in brodo, tagliatelle on a ragout sauce, fried veal cutlet with mashed potatoes. Address: Via degli Avignonesi 22; Phone: +39 06 481 7538; Website: www.collineemiliane.com; Prices: 10-14 euro first courses, 15-22 euro main dishes. A new opening in the city centre, Il Marchese Osteria is one of the places where the locals eat in Rome. Among their dishes is the carbonara del Marchese with handmade pasta, vaccinara oxtail ravioli dumplings,steamed codfish on zucchini and mint cream, beef meatballs as well as a choice of salads. Inside the restaurant is also a market and a well-assorted bar that proposes a large choice of cocktails. At the Amaro Bar, you can also have an aperitif every day from 6.30 to 9 pm. Address: Via di Ripetta 161/164; Phone: +39 06 90218872; Website: www.ilmarcheseroma.it; Prices: 12-16 euro first courses, 16-21 euro main dishes. Located in Prati area, L’Arcangelo is the creation of chef Arcangelo Dandini. One of the trendy restaurants in Rome, here the local tradition is prepared with a very personal touch. This is one of the places where the locals eat in Rome, where the traditional Roman dishes are served in an elegant style together with the chef’s personal creations. One of the best eats in Rome, try their egg tagliatelle, risotto with anchovies, capers and grape juice, squid with peaches in syrup, roasted salted codfish. Address: Via Giuseppe Gioachino Belli 59; Phone: +39 06 321 0992; Website: www.larcangelo.com; Prices: 15-18 euro first courses, 22-30 main dishes. Since Armando Al Pantheon found its place among the top eateries in central Rome, for the traditional menus we will mention different restaurants. Serving one of the best pasta alla gricia in Rome, Cesare serves all the classics from the Roman tradition. One of the best places to eat in Rome, some of the dishes to try here are the seafood tonnarelli, rigatoni all’amatriciana, spaghetti with clams, tripe on a tomato sauce, salted codfish Roman style. Address: Via del Casaletto 45; Phone: +39 06 536015; Website: www.trattoriadacesare.it; Prices: 9-10 euro first courses, 11-18 main dishes. 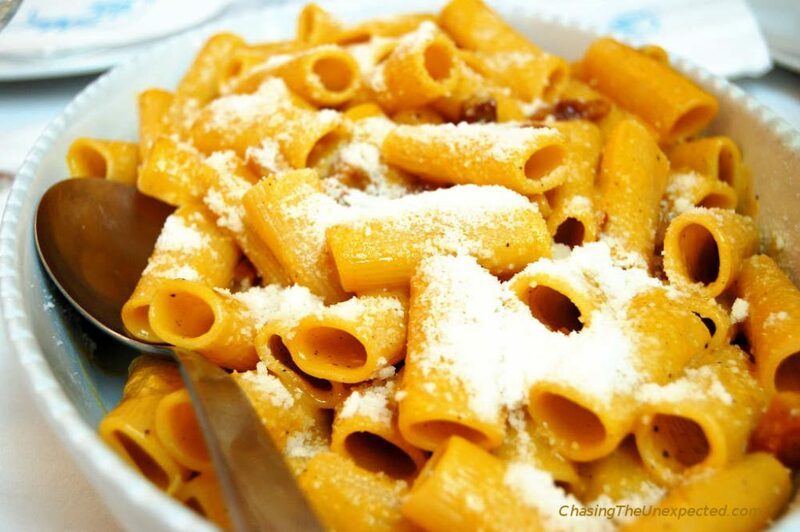 Close to the Trevi Fountain, Al Moro serves some of the top things to eat in Rome. If you landed in the Italian capital with the intention of trying the proper local food in Rome without getting too far from the main monuments, this is one of the top eateries to try. The pasta is fresh because this is how tradition recommends, the cakes are artisan made, cheese and cold cuts locally-sourced, the ingredients seasonal. Some of the Roman dishes to order here are tagliatelle on white or black truffle, spaghetti with clams, gnocchi Roman style, roasted lamb with potatoes, veal scaloppine with artichokes. One of the top places where to eat in Rome city centre, its menu includes also a wide range of fish and seafood options. Address: Vicolo delle Bollette 13; Phone: +39 06 678 3495; Website: www.ristorantealmororoma.it/en/; Prices: 16-35 euro first courses, 22-40 main dishes. Located in the former working-class Testaccio neighbourhood, Flavio Al Velavevodetto is another of the best restaurants in Rome for the traditional recipes of the cucina povera. Around Testaccio there are also plenty of things to do, such as visiting the Non-Catholic Cemetery, Rome’s Pyramid of Cestius and the street art from here to the nearby Ostiense neighbourhood. Address: Via di Monte Testaccio 97; Phone: +39 06 574 4194; Website: www.ristorantevelavevodetto.it/index_en.html; Prices: 10-14 euro first courses, 12-18 main dishes. READ MORE: I explored Testaccio and its cuisine with Eating Italy Food Tours. We had lunch right here at Flavio Al Velavevodetto and we tried also the local pizza, and gelato. Read my full review of their Taste of Testaccio Rome food tour. This is also a great place to try Roman food and pizza in Testaccio. Find many traditional dishes like fettuccine pasta with frattaglie di pollo (chicken giblets), the very Roman soup with broccoli e arzilla (Roman broccoli and ray), tripe, amatriciana. If you don’t fancy meat dishes, you can choose one of the many fish and seafood options. Sweet lovers should try also their specialty dessert ricotta and sour cherries cake. Piatto Romano is closed on Wednesday. Address: Via Giovanni Battista Bodoni 62; Phone: +39 06 6401 4447; Website: www.piattoromano.com; Prices: 9-10 euro first courses, 9-18 main dishes. This is one of the institutions of the real cucina romana and one of the historic restaurants in Rome. Checchino has been serving traditional Roman dishes for decades, and some of his signature recipes don’t show any sign of cooling. Dishes like rigatoni with pajata, a sauce made with tomato and a part of the intestine of a young calf, and beef oxtail alla vaccinara are always on the menu and always popular. Here, you can try pretty much all of the quinto quarto, the parts of the animal that back in the day the rich didn’t want and the osterie for the working class would use them to create tasty and bold dishes. Tripe, liver, heart, brain, innards, tongue, spleen and such parts all together compose the quinto quarto and are now the ingredients of a traditional Roman meal. Checchino is pricey, so be aware that here you are likely to spend more than many other recommended restaurants in Rome. 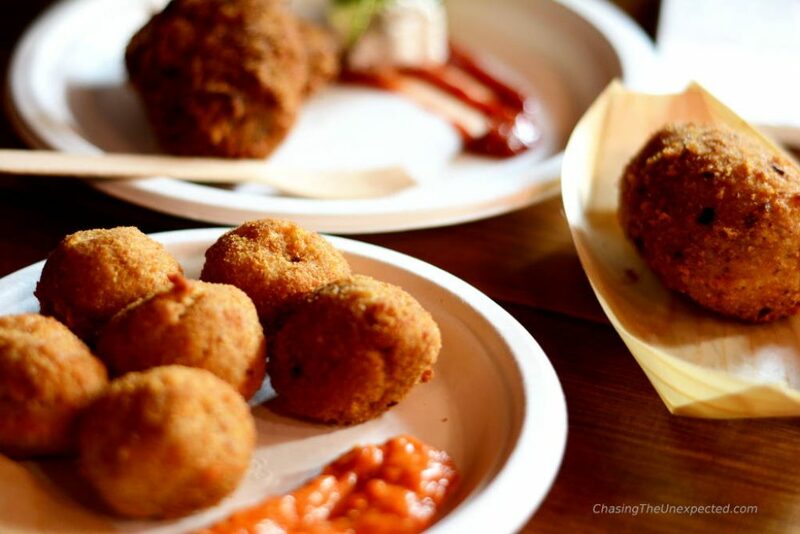 Address: Via di Monte Testaccio 30; Phone: +39 06 574 3816; Website: www.checchino-dal-1887.com; Prices: 9-16 euro first courses, 12-27 main dishes. Located in the crowded heart of Trastevere, Enzo is always a safe choice and often referred to as one of the best restaurants in Rome city centre. One of the historic trattoria in Rome, Enzo has been open since 1935. A family-run osteria in central Rome, here tradition blends with a hint of modernity but without disappointing its regular Roman guests. The restaurant is unadorned and not too big, menu includes five of the most popular pasta dishes and four of the most famous traditional main courses such as tripe Roman style, beef oxtail alla vaccinara, grilled lamb ribs and meatballs. To the fixed courses, the menu includes also the dishes of the day, which are seasonal depending on the local products. Closed on Sunday, prior booking recommended and accepted only for dinner. Address: Via dei Vascellari 29; Phone: +39 06 581 2260; Website: www.daenzoal29.com; Prices: 11-12 euro first courses, 11-17 euro main dishes. This is also one of the historic restaurants in Rome Testaccio neighbourhood. An institution that has been serving Roman cuisine for some 80 years, here the cacio e pepe is excellent, defined by many some of the best pasta in Rome. The menu changes every day of the week. Every day there are traditional Roman dishes as well as personal creations. You can find also fish dishes. Address: Via Mastro Giorgio 29; Phone: +39 06 574 6800; Website: feliceatestaccio.it/roma/; Prices: 10-13 euro first courses, 14-28 main dishes. If you are wondering where locals eat in Rome when they want traditional food, Zampagna All’Ostiense is one of those places. Here they follow tradition with both the recipes and their calendar. So on Thursday the menu proposes gnocchi, Friday salted codfish and Saturday tripe. You don’t fancy any of these? Don’t worry, every day there are several options. Fares are pretty reasonable, so if your concern is the food prices in Rome, this is a place to try in the lovely Ostiense neighbourhood. At Zampagna All’Ostiense you will find some of the best food to eat in Rome when it comes to non-touristy authentic local cuisine. The unadorned and old-fashioned ambiance of one of the very great restaurants in Rome is not just theatrical. Just like the decoration, also the Roman food of this popular restaurant in Garbatella working-class neighbourhood perfectly reflects tradition. The usual dishes like cacio e pepe, amatriciana and carbonara are on the menu alongside other treats of the Roman cuisine like rigatoni pajata pasta, and abbacchio scottadito lamb. This is where to eat in Rome if you feel like trying a dish from the real cucina povera while exploring a neighbourhood far from the tourist path. Address: Via Giustino de Jacobis 9/15; Phone: +39 06 5160 7422; Prices: 8-10 euro first courses, 8-15 main dishes. One of the best family-friendly restaurants in Rome serving traditional food, at Mamma Angelina you will always find a warm and cozy atmosphere. This is where the locals eat in Rome Quartiere Africano when they want quality food and tradition with some innovative and creative dishes, with a large choice of fish options. Appreciated by the regular customers especially for their great fried calamari and hand-sliced potatoes. Here you won’t find a chef-style gourmet cuisine but more of a homemade, Italian mom/grandma type of food. Address: Viale Arrigo Boito 65; Phone: +39 06 860 8928; Prices: 10 euro first courses 15 euro main dishes. A stone’s throw from Campo de’ Fiori, in the very city centre and in one of the busiest tourist areas. Yet, its prices of this great osteria make it one of the best affordable restaurants in central Rome. Decoration typical of a traditional Roman trattoria and menu offering the classics of the local cuisine plus the dishes of the day that always change. Their focaccia is a must. Address: Piazza della Cancelleria 80-84; Phone: +39 06 689 7080; Website: hosteriagrappolodoro.it; Prices: 11-13 first courses, 15-18 main dishes. Located in the Via Flaminia Vecchia not far from Ponte Milvio, Il Quinto Quarto is not in the immediate city centre. Popular among locals, here your Roman meal is prepared only with high-quality ingredients and the result confirms this. So plenty of rooms to the genuinely Italian lentils from Ventotene, potato of the Viterbo area, olives from Gaeta, the hazelnuts from the Cimini mounts and such delicacies. If you are wondering where the locals eat in Rome, this is one of the favourites. Open only for dinner, Sunday only lunch, aperitif from 6.30 pm. Address: Via Flaminia Vecchia 638/640; Phone: +39 06 333 8768; Website: www.ilquintoquarto.it; Prices: 9-12 euro the first courses, 12-15 euro the main dishes. Old-style and cozy decor in this osteria in Rome’s Via Casilina, not in the immediate city centre but easy to reach with a 20-minute bus ride from Termini station. If your concern is food prices in Rome, this is a very affordable restaurant where you are sure quality won’t be compromised. Address: Via Casilina 493; Phone: +39 06 241 3229; Website: www.facebook.com/pg/dafrancescoerlaziale; Prices: 7-9 first courses; 10-12 main dishes. This is one of the historic restaurants in Rome in the Esquilino neighbourhood close to Santa Maria Maggiore. The vintage decor and the homemade cuisine are the perfect reminder of the old times. This restaurant is close to the city centre so a perfect break in your Rome sightseeing. Address: Via Petrarca 13; Phone: +39 06 7720 0111; Website: www.trattoriadadanilo.com; Prices: 12 euro the first courses, 12-22 euro the main dishes. This is a well-known restaurant in central Rome and very popular among tourists. If I were looking for non-touristy restaurants in Rome, probably I wouldn’t stop here. This is the new opening by the owners of the one of the best Rome bakeries, Antico Forno Roscioli, and comes as a restaurant, a deli and wine bar. The bread comes from the historic bakery and the menu proposes the dishes from the tradition as well as their own creations. Very crowded, prior booking is highly recommended. Here the Roman tradition is on menu together with the rich fish and seafood gastronomy from Puglia and Sicily regions. A traditional restaurant in the historic San Lorenzo quarter with a yesteryear decor and a rich homemade cuisine. Many dishes are seasonal, some of the recipes to try are their lamb pappardelle, spaghetti with anchovies and Pecorino, tiella of rice, potatoes and mussels. Address: Via dei Reti 46; Phone: +39 06 490 416; Website: www.tramtram.it; Prices: Average 25-30 euro. Traditional restaurant in Rome Tor Pignattara neighbourhood serving generous portions and quality products. Very simple interior typical of the old osteria rionale of Rome with wooden tables and chairs and a dashboard for the daily menu make it for a cozy and family environment. Famous for its horse meat and sausages. The restaurant is not close to any major monument but it’s easy to reach from Termini with half an hour bus. It’s a perfect stop if you are away of the well-known names and you are looking for an authentic lunch in Rome. Address: Viale dell’Acquedotto Alessandrino 172; Phone: +39 329 863 3077; Website: www.facebook.com/Osteria-Bonelli-427233444051834/; Prices: 7-9 euro the first courses, 8-12 euro the main dishes. One of the most famous and oldest trattorie in Rome, Lo Scopettaro in Rione Testaccio is a favourite for the rich flavours of its dishes and the generous portions. Here the tradition is celebrated with the quinto quarto served in a variety of ways and several recipes of the old cucina povera. A true tribute to the local authentic flavours that our Rome food guide couldn’t miss. A guarantee for your dinner in Rome with friends and family. Address: Lungotevere Testaccio 7; Phone: +39 06 575 7912; Website: loscopettaroroma.com; Prices: 10-15 euro the first courses, 13-20 main dishes. Known as Rome’s oldest restaurant, La Campana has been delighting hungry customers for some five centuries. Run by the same family since its inception, La Campana is located in the very city centre near the river. Excellent the dishes of the tradition and fish lovers will have several option in a menu that successfully combines history and modernity. Address: Vicolo della Campana 18; Phone: +39 06 687 5273; Website: www.ristorantelacampana.com; Prices: 10-14 euro first courses, 11-18 euro main dishes. This is an “ultra-orthodox” of the Roman cuisine. Perfect for who loves the strong taste of the offal and all the parts included in the quinto quarto, from the trip to the tail. The menu isn’t huge but if you are looking for an authentic Roman meal, this is definitely one of the unmissable Rome restaurants. Address: Via Giovanni Branca 98; Phone: +39 06 574 6585; Prices: 10 euro for first courses, 14 euro for main courses. In this popular restaurant in Rome Trastevere quarter, the tagliolini cacio e pepe are served on a little cheese basket for the gluttonous customers who can’t resist. The traditional dishes of the Roman cuisine are prepared with a great attention to detail. This restaurant is perfect for your lunch in Rome as a break for your sightseeing as it’s close to the beautiful Santa Cecilia in Trastevere Basilica in the heart of the city. Address: Piazza di Santa Cecilia 24; Phone: +39 06 580 0757; Website: www.romasparita.com/en/; Prices: 10-13 first courses, 12-18 main dishes. Dol stands for “Di Origine Laziale”, of Latium origins, just like all the ingredients and products in their menu. The menu offers only excellent locally-sourced products. A wide range of starters, first courses and main dishes. Some options also for vegetarians and pescatarians. The pizza they serve is by Bonci, so no less than delicious. Address: Via Domenico Panaroli 35; Phone: +39 06 2430 0765; Website: dioriginelaziale.it. READ MORE: Feeling adventurous? 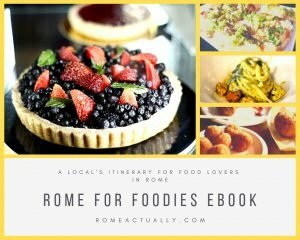 Try a wide range of diverse restaurants in Rome with our foodie guide eBook Tasting Rome by Neighbourhood. Close to Campo de’ Fiori, Per Me, managed by chef Giulio Terrinoni, is a fantastic fish restaurant in central Rome. With a large choice of raw and cooked fish, here you will find high-quality gourmet cuisine. In an ever-changing menu, they serve mainly fish and seafood dishes but you can find also some meat options. Perfect for a romantic dinner in Rome city centre surrounded by the major landmarks and a real treat. Dress code is smart casual, booking is recommended. Address: Vicolo del Malpasso 9; Phone: +39 06 687 7365; Website: www.giulioterrinoni.it/eng/the-restaurant/; Prices: 28 euro the first courses, 40-45 euro the main dishes. Considered one of the best fish restaurants in Rome, ilSanLorenzo serves only gourmet cuisine. This is not a cheap eat, so expect to pay more than many nearby restaurants. The highest quality of the ingredients translates into excellent original creations. You can choose the menu a la carte or a tasting with a sample of several dishes for 90 euro. Address: Via dei Chiavari 4/5; Phone: +39 06 686 5097; Website: www.ilsanlorenzo.it; Prices: 26-36 euro first courses, 35-55 main courses. A large choice of raw and cooked starters is a perfect way to start the meal at Tempio di Iside, popular fish restaurant in Rome close to the Colosseum. Expensive like most high-quality fish and seafood restaurants in the city centre, here you will try delicacies like tuna tartare, prawn carpaccio, mussels, oysters, spaghetti with sea truffle or sea urchins, fusilli with cherry tomatoes, red prawns and Pecorino cheese. The main dishes are never the same, depending on the season and the catch of the day. Address: Via Pietro Verri 11; Phone: +39 06 700 4741; Website: www.isideristorante.it; Prices: 16 euro first courses, 20-40 main courses. At La Torricella in Testaccio area you can find traditional fish-based dishes such as spaghetti with clams, fish soup, grilled prawns, fish in the oven, as well as several meat options and pizza. An affordable restaurant not far from the city centre in a nice neighbourhood close to the great Mercato Testaccio. Address: Via Evangelista Torricelli 2; Phone: +39 06 574 6311; Website: www.la-torricella.com; Prices: 8-13 the first courses, 11-22 the main dishes. Located close to La Giustiniana train station, northern Rome along the F3 railway to Cesano/Bracciano/Viterbo, this is a good restaurant in Rome with more affordable prices than many in the city centre. It’s not close to any major monument, but the train takes you to central Rome in half an hour stopping at metro lines A and B.
Ristorante Giustiniana is a Sardinian restaurant and its menu offers both fish and meat options. If you are looking for a fish and seafood based dinner, here you can choose for a fixed menu or order a la carte. The fixed menu consists of a large selection of starters with fresh raw and cooked fish and seafood creations, a sample of two or three first courses and a choice of a main course. The restaurant is very big, but booking is recommended especially on weekends and holidays. Address: Via Cassia 1298; Phone: +39 06 3036 5203; Website: www.ristorantegiustiniana.it; Prices: 12-15 euro first courses, 20-25 euro main dishes, 35 euro each fixed menu. 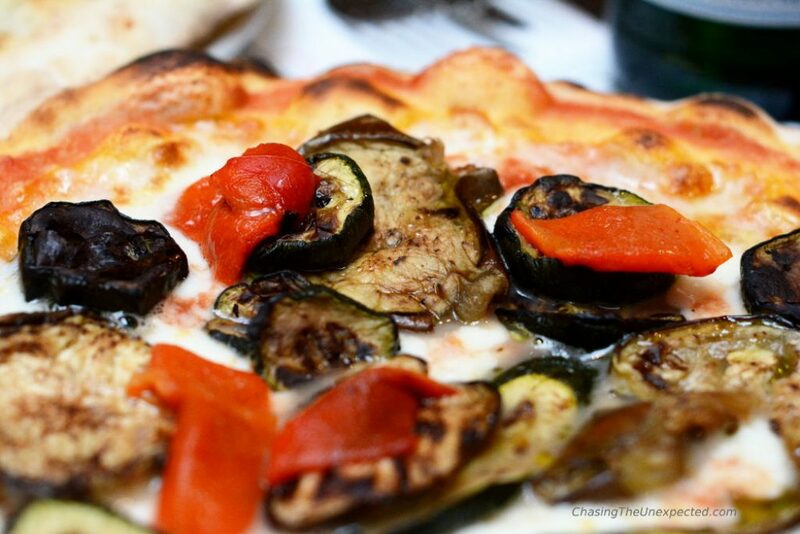 Some of the best pizza places in Rome, most open only for dinner, some also for lunch. Emma serves the pizza Roman style, thin and crunchy. Or “scrocchiarella”, how they call it in Rome. They have a long list of pizza, their dough made with organic flours and a long leavening by Roscioli. The toppings include buffalo mozzarella, Pomilia tomatoes, Scottish salmon, Parma ham, Cantabrico anchovies and more excellent products from Italy and Europe. Address: Via del Monte della Farina 28; Phone: +39 06 6476 0475; Website: www.emmapizzeria.com; Prices: 7-18 euro. Pizzeria Da Remo offers a large selection of pizza and side dishes and fried appetizers such as supplì and fried codfish. Typical Roman pizza in an authentic Roman neighbourhood. Visit Testaccio, is monuments, street art, nearby Ostiense district, and go to Remo’s for a well-deserved scrumptious pizza. Open only for dinner, closed on Sunday. Address: Piazza di Santa Maria Liberatrice 44; Phone: +39 06 574 6270; Website: www.facebook.com/pizzeria-Remo-a-testaccio-133041203421714; Prices: 5-10 euro. Pinsere is a street food pizza place. You order from the menu hanging on the wall or directly from the choice on display. They have a large choice for every taste and preference, vegetarian included. 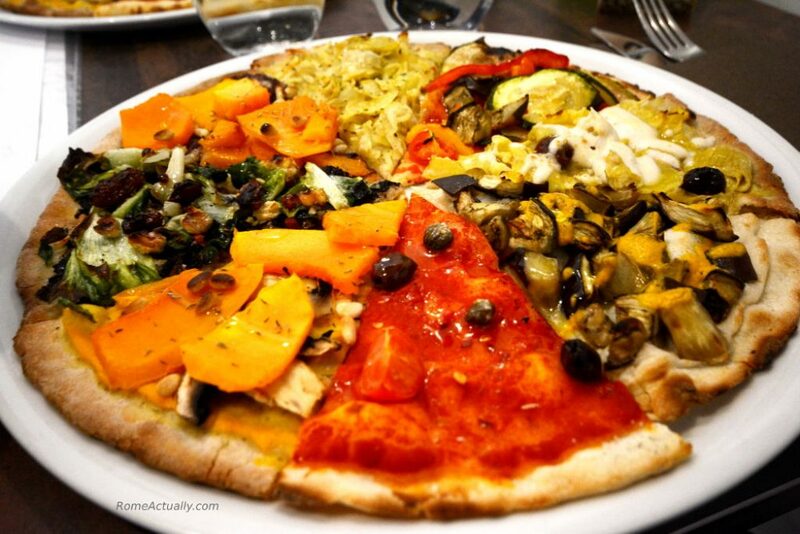 Their oval-shaped pizza is made with organic flours, very light and crunchy, easy to digest and delicious. If you are looking for a quick casual lunch in Rome, this is a good choice. Easy to reach from Termini station. Address: Via Flavia 98; Phone: +39 06 4202 0924; Website: www.facebook.com/Pinsere; Prices: 4.50/5 euro per pizza. Home to the very Roman pinsa, La Pratolina is in Prati neighbourhood and has been considered for years one of the best pizza in Rome. Light and easy on the stomach, the pinsa here comes with a great variety of toppings: mushroom, wild boar mortadella, truffles, salmon, different types of cheese. If you are wondering where to eat in Rome for a nice dinner with pizza, this is your place. Open only for dinner, Sunday closed. Address: Via degli Scipioni 248; Phone: +39 06 3600 4409; Website: www.pizzerialapratolina.it; Prices: 8-12 euro. 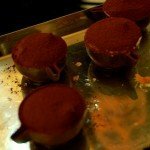 A small selection of vegetarian and vegan restaurants in Rome that are always more and more appreciated. A relatively new opening on the vegan food scene in Rome, Madre Terra serves original creations with a daring and successful combination of ingredients. They prepare pasta with different sauces, Buddha bowls, soups, veggie burgers as well as pizza and vegan sushi. With the first courses starting at around 5 euro, this is a pretty affordable restaurant in Rome. Address: Via Nomentana 223; Phone: +39 06 4423 9392; Website: www.facebook.com/madreterraroma; Prices: 5-5 euro the first courses, 10 euro the main dishes. If you are a vegetarian and love cats, this is your place. Romeow serves vegan dishes for lunch and dinner, their menu changes very often. You will always find a nice combination of Mediterranean and international flavours prepared with high-quality ingredients and plenty of creativity. Among the vegan restaurants in Rome, so far this is one of my favourites. Address: Via Francesco Negri 15; Phone: +39 06 5728 9203; Website: www.romeowcatbistrot.com; Prices: 10-13 first courses, 15-17 main dishes. This is a fantastic vegan buffet all-you-can-eat in Rome for lunch and dinner. After grabbing a table, take your dish and fill it. At the check out, put it on the scale and they will start charging your table. On the buffet there is a large choice of starters, first courses, main dishes, salads, rice, pasta, dips and sauces, seeds and nuts, fruits and cakes. This restaurant is close to Piazza Fiume and the quirky Quartiere Coppedè, one of Rome’s hidden gems. Address: Via Bergamo 56; Phone: +39 06 841 1769; Website: opsveg.com; Price: 2,60 euro per 100g. Orto is another vegetarian buffet all-you-can-eat in Rome. 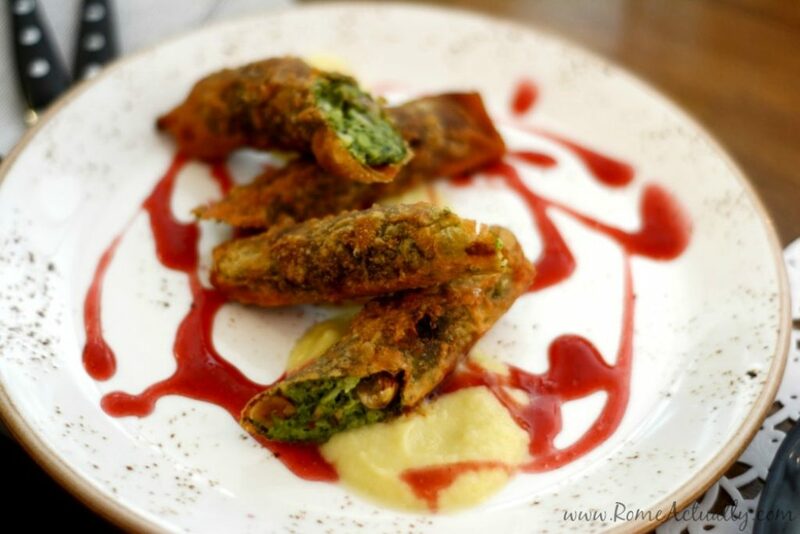 Here you can find both vegan dishes and course made with eggs and dairy products. The gate is a old-style farm wooden door, don’t be mistaken, that’s really the entrance. Inside is decorated like an ancient farm, with working tools and old-fashion chairs and tables. On the buffet you will find all types of veggie dishes, from pasta, lasagne, omelettes, savoury pies, baked veggies, pizza, salads and also cakes for the dessert. The dishes of the buffet change every day and even on the same day waiters keep coming out of the kitchen with different trays as soon as the other ones are finished. The buffet is only for lunch on weekdays. The weekend they propose a brunch for a fixed price of 15 euro. Address: Via Giuseppe Gioachino Belli 142; Phone: +39 06 4567 8050; Website: ristoranteorto.it; Prices: 9 euro the daily buffet, 10-12 the dishes on the menu, 15 euro the weekend brunch. Open in 1979, this is one of the very first vegetarian restaurants in Rome. Here you find both both vegan and lacto-ovo vegetarian dishes. They are extremely well-made and extra attention is paid to the detail. They serve brunch, dinner and aperitif. It’s a bit pricey, so be aware here you can spend more than in other vegetarian places in Rome. Address: Via Margutta 118; Phone: +39 06 3265 0577; Website: ilmargutta.bio; Prices: 15 euro for the brunch (25 on weekends and holidays), 11-15 euro first courses, 12-18 main dishes. READ MORE: For more vegetarian and vegan restaurants in Rome, check out our updated comprehensive guide. If you are wondering where to eat in Rome on a budget, these street food options are a great choice. A stall inside Mercato Testaccio, Mordi e Vai prepares rich sandwiches filling them with the dishes of the Roman tradition. So you will find sandwiches with tripe, sausages, meatballs and more. A great place to combine traditional Roman food with a quick lunch on the go. Address: Via Beniamino Franklin 12E, BOX 15 of Mercato Testaccio; Phone: +39 339 134 3344; Website: www.mordievai.it; Price: 3-5 euro. Very popular street food place in Rome city centre, Supplizio is a stone’s throw from Campo de’ Fiori. A selection of supplì, meatballs, salads and other appetizers make it a popular hangout place in central Rome for either a quick, casual lunch or a mid-day snack. You can sit inside, if you find a place on a chair, stool or the couch as it’s very small, or just grab something and eat on the go. Address: Via dei Banchi Vecchi 143; Phone: +39 06 8987 1920; Website: www.supplizioroma.it; Price: 2-7 euro. Trapizzino is a mix between the typical Italian bar white sandwich “tramezzino” and pizza. The fillings can be traditional Roman food or new creations. 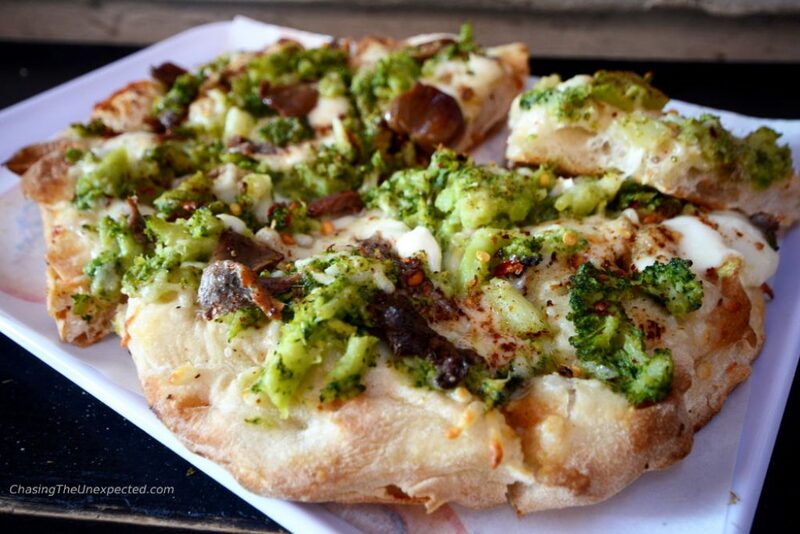 The crust is made with stone-ground flours and sourdough starter, the fillings made with organic products. It quickly became so popular that it has now opened five shops in Rome as well as one in other cities like Milan, Florence, Trieste, Ladispoli, Latina and even New York. If you are looking for a place to eat in Rome but don’t want to take too much time from your sightseeing, this is a great eatery for a cheap and satisfying meal. Address: Via Giovanni Branca 88 (Testaccio), Piazza Trilussa 46 (Trastevere), Piazzale di Ponte Milvio 13, Via Vespasiano 2 (Prati/Trionfale), Via Giovanni Giolitti 36 (Mercato Centrale, Stazione Termini); Website: www.trapizzino.it; Price: 2-4 euro. Fan of the Vikings? Well, here you can have a taste of their food. 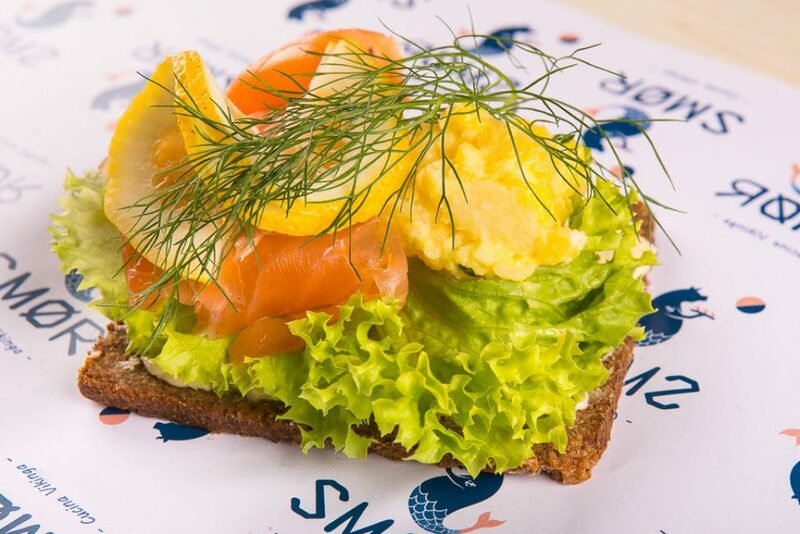 This delicious street food is specialised in Scandinavian recipes. So you will find plenty of fish, very fresh and prepared marinated, smoked, steamed and more. While fish is the main ingredient, you will also find meat-based sandwiches and appetizers. Address: Via Cesare Paoletti 23; Phone: +39 06 9784 2095; Website: www.facebook.com/smorcucina; Price: 2-10 euro. A small selection of Rome’s most famous luxury restaurants, one in the city centre, one with a beautiful view on Monte Mario hill. A famous luxury restaurant in Rome is Michelin 3-star La Pergola of Rome Cavalieri Waldorf Astoria Resort. Chef is Heinz Beck and the dishes are a blend of creativity, innovation and Italian tradition as well as international influences. This is one of the most luxurious restaurants in Rome and definitely not a cheap eat so expect to pay around 300 euro per person for a complete meal or 260 for the tasting menu. The experience reflects the price: a breathtaking view of the city from Monte Mario hill and exceptional food. Address: Via Alberto Cadlolo, 101; Phone: +39 06 3509 2152; Website: romecavalieri.com/it/la-pergola-it; Price: 55-69 euro the starters, 49-69 the first courses, 59-67 the main dishes. Located in an elegant 18-century palace, Achilli is the exclusive 1-Michelin-star restaurant of Rome’s 5-star DOM Hotel. Here the cuisine is contemporary made with high-quality products and a daring combination of flavours. Address: Via Giulia 131; Phone: +39 333 217 9279; Price: 30-150 euro on average.